Give the greatest gift any Disney fan could possibly wish for with this Tinker Bell-inspired charm bracelet. 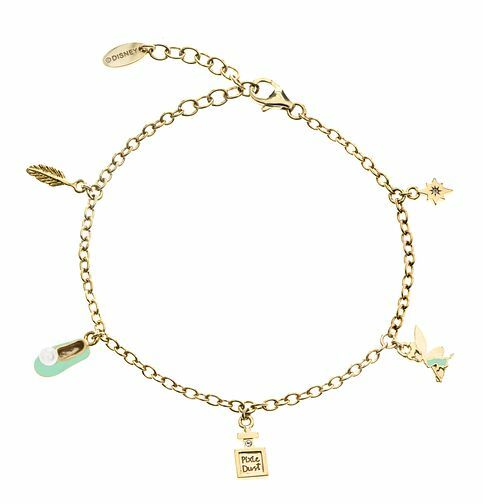 Created in gold plated sterling silver, this bracelet features charms from the iconic fairytale decorated in a light teal enamel and clear crystals, including a slipper charm, pixie dust bottle charm and a charm of Tinker Bell herself. Make dreams come true with this beautiful Disney Tinker Bell charm bracelet. This design is exclusive to H.Samuel and each piece comes with its own beautiful Tinker Bell gift box and bracelet pouch. This is a 6" chain bracelet with a 1" chain extender. Disney Children's Tinker Bell Gold Plated Charm Bracelet is rated 5.0 out of 5 by 1.